The set comes with 2 minifigs: one 'normal' character with the yellow face, and another which I would describe as humanoid. Both are dressed in an orange jumpsuit. 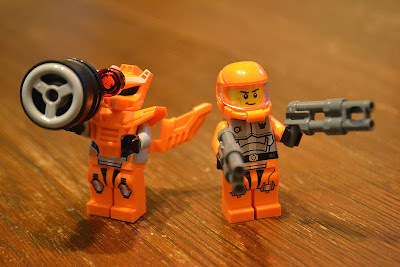 Accessories include a helmet and 2 guns for the former, and 'wings' and a big barrel-like gun for the latter. 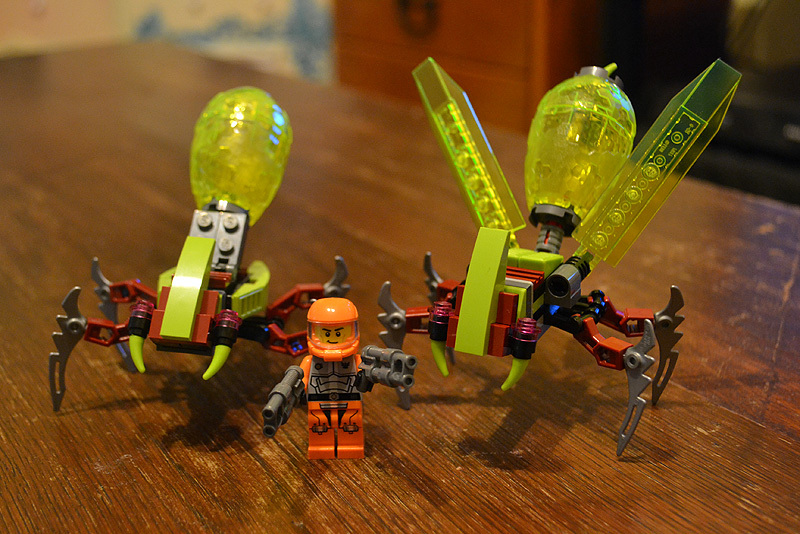 For villains, the set comes with 2 alien bugs, pictured with the minifig below for size comparison purposes. These two bugs were a nice build too. Their abdomens are actually chambers where you can place a minifig inside, sort of like getting captured. 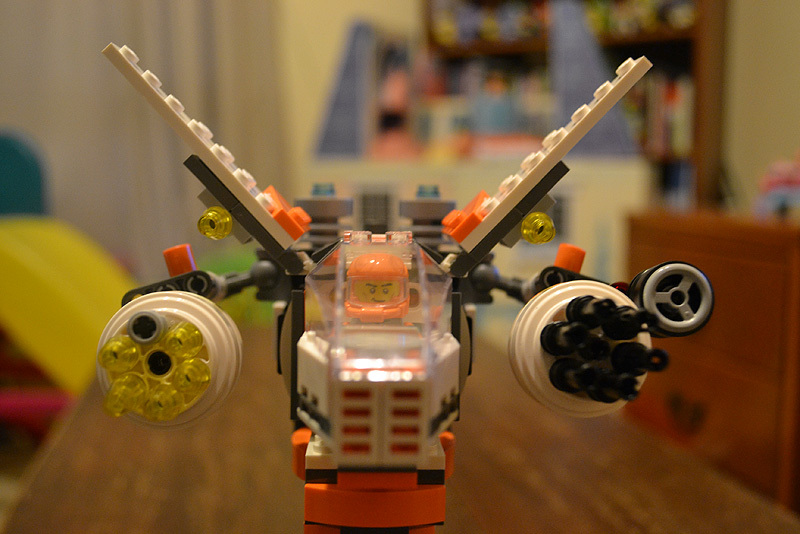 Although the implications of being in this abdomen are rather gross, like the minifig was captured for dinner! 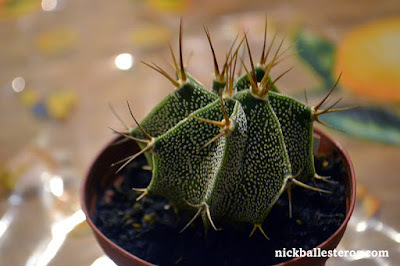 So perhaps it's better to think of these alien bugs as machines instead of organic creatures. Yeah, I guess I'm thinking too much into how this set is supposed to be played. And now for the vehicles! 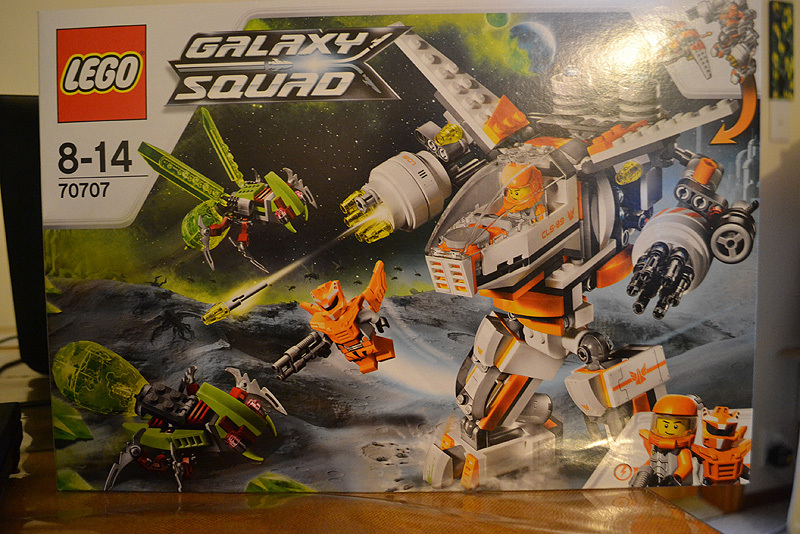 At the left of the top photo is the Galaxy Jet, and at the right is the Mech Exosuit. 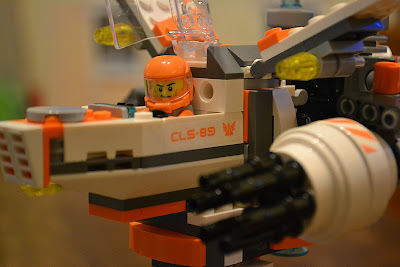 Nice details, and we enjoyed building this as well. It took us around 3 hours cumulative to build the entire set. Note that there are 2 manuals, so you can imagine that there's quite a number of pieces to go through (not that we're complaining!). 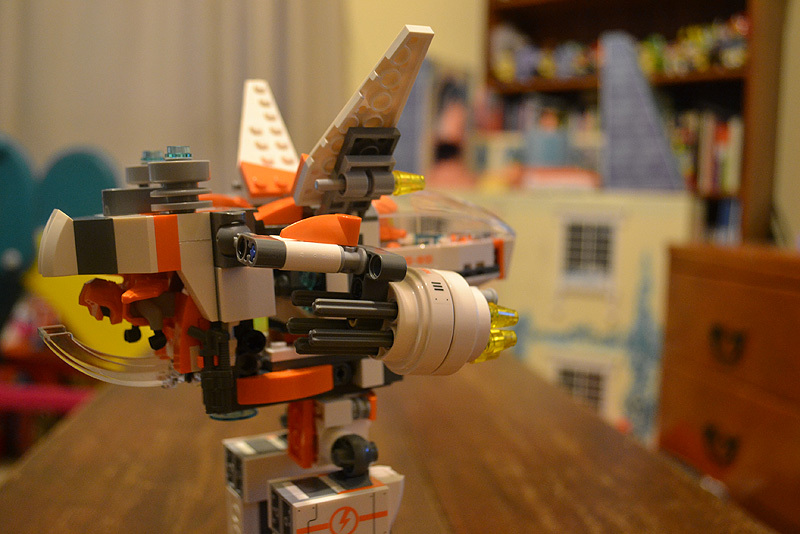 There are also stickers to apply, which my son happily delegated to me. 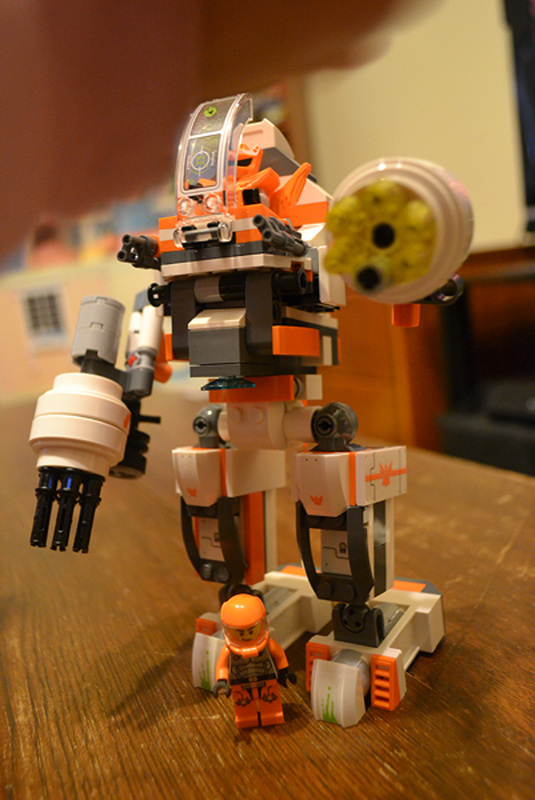 The right arm is a gatling gun, and you can simulate the rotating action by turning the cylinder at the back. 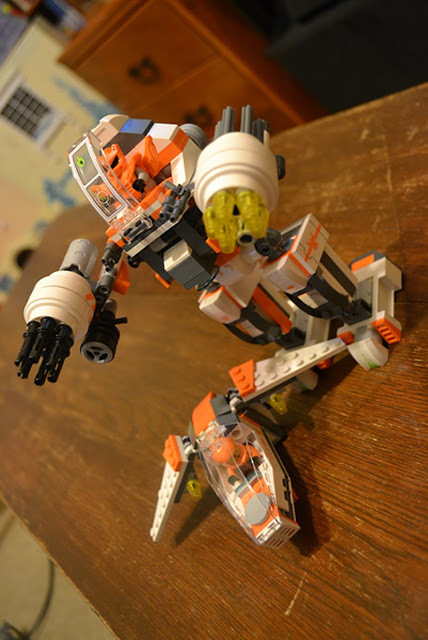 The left arm is loaded with missiles which can pop out. The jet also has a couple of missiles. You might be thinking, this set is not all good points! And you're right. The joint connecting the foot to the leg does not lock, unlike those that join the body with the legs and the arms. Meaning the exosuit can easily tumble if unbalanced. Good thing it's not that difficult to balance! Poseability-wise, the points of articulation are limited to the joints so don't expect to display this in a dynamic pose. But as a toy, it's really good value. There are also a number of small pieces, especially the missiles. So there's a good chance that these can get lost and accidentally vacuumed into oblivion. 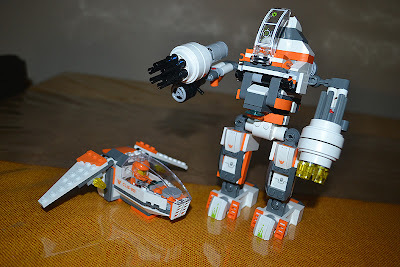 We like this set, especially as the vehicles combine. We are currently watching Gundam AGE, and are reminded of the AGE-3 model. Overall, we like this model and will surely get a lot of gameplay. Here is a video of my son building and talking about this set!